Wr i te readab le co de! Don’t abuse lambdas and streams ! where those came from . Puzzlers? Gotchas ? Fetal position inducing behavior ? 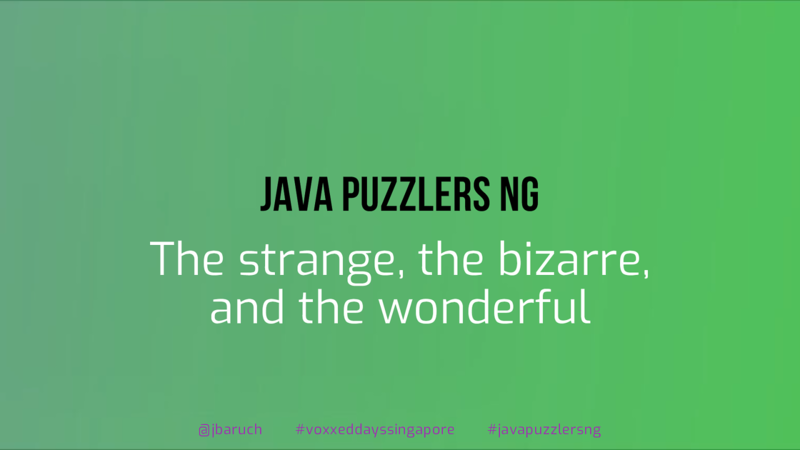 View Java Puzzlers NG: The strange, the bizarre, and the wonderful on Notist. Not sure about you, but working with the latest versions Java made me lose all of my hair and most of my sleep (or was it the jet lag?). If you still haven’t reached the level of Brian Goetz in mastering lambdas and strings, this session is for you. And if you think you have, here’s some bad news for you: you should attend as well. You’ll see some surprising, bizarre, and inconceivable parts of the latest versions of Java, so you won’t be (too) surprised when they hit you in production. Like any other puzzlers session, this one consists lots of puzzling questions, answers from the audience, t-shirts flying around, and a lot of fun—all for one purpose: to make you understand the latest versions of Java better.